After a long flight from Norway, I arrived safely and slightly brain fogged in New Delhi this morning (too much TV on the plane – and a little tip for you if you where considering watching G.I Joe retaliation – don’t!). Arriving in India for the 7th time so far in my life, I was full of mixed emotions. Part of me was extremely excited to be on the road again, looking for adventure. Another part of me was feeling sad and guilty for leaving behind Michelle in Norway – I have just moved there a month ago, and now I am already hitting the road again! A third part of me was feeling nervous and anxious on how things would pan out in terms of photography. Well once I stepped out of the plane, there was no turning back and the reality hit me – India is truly the place where you can only expect one thing – the unexpected. Having retrieved my luggage I excited the airport around 3AM and found myself a taxi driver – or so it would seem, but reality was rather that he found me! He asked me where I was going, and was unsure about the address so he asked for the phone number of the hotel I had booked and rang up the number for me. When I spoke to the hotel in the other end they where very sorry to inform me that my booking had been cancelled due to the ongoing festival. I would later learn that this was in fact a very well organised scam – kudos for their execution – the first time I have ever been scammed on such an advanced level. The taxi driver entered the phone number, but apparently rang another number where his partner in crime with was pretending to be the hotel I had booked. However, as the hitchhikers guide to the galaxy states on the front page – DON’T PANIC. And I didn’t – six previous visits to India has taught me to expect the unexpected, and go with the flow. At 4AM I was plenty awake to bargain hard, and I ended up checking into another hotel costing only a fraction of the prize for the one I had original booked online. So even if I feel slightly violated for being scammed, I still ended up saving a fair amount of money. And this bring me to my point – India is a place where you are measured up for size constantly. There is no point in panicking about feeling violated, because trust me you will feel it a lot during your stay in India! More than a billion people live here, and the Indians are fierce tradesmen, with no time for messing about. And this is exactly one of the reasons I keep returning here. I like having to feel things again. Back home in Scandinavia everything is so organised and non-invasive. Life is very pleasant. Very easy. Very vanilla. In India your senses are constantly bombarded – ranging from the spicy food, to the spicy people, to the whole craziness of this massive society. In a way it is ironic that I travelled to the other side of the world to test a tiny camera – the fuji x100s, which has been designed to be very unobtrusive and anonymous. Because the camera sure is exactly that. But the man carrying it is not. A white person is always more exposed to attention in India – for sure. But add 195cm height and 110kgs of body mass to the equation and there is nothing stealth about me here in India. Now you might wonder why I bring up my body weight. Well I will have you know, that I was measured today – literally! 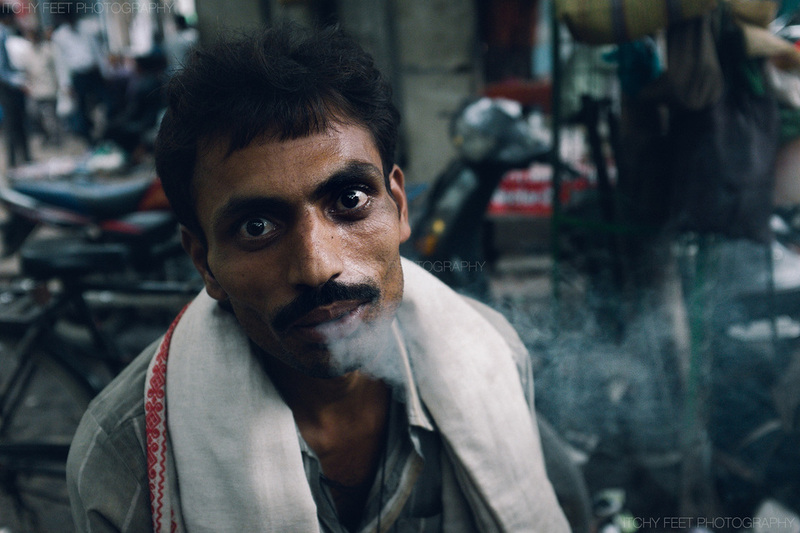 During my walks on the street, taking some portraits, a crowd of people got interested in me. 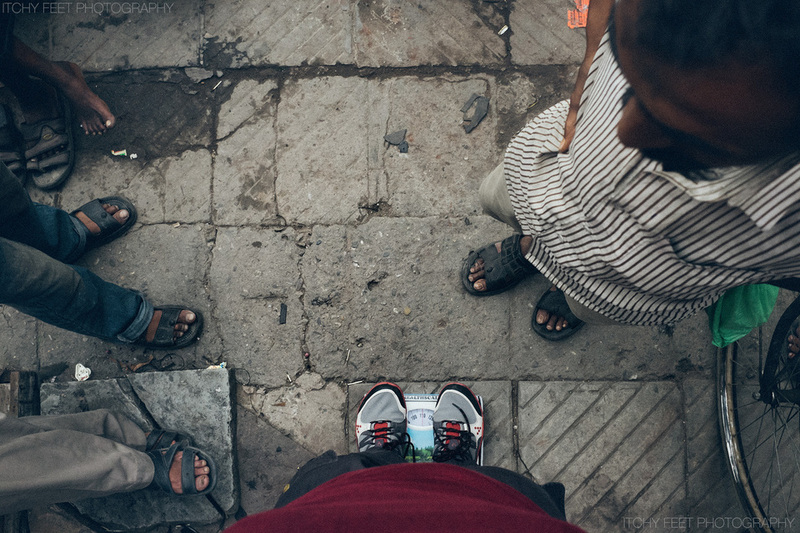 So sure this guy is white, and tall, and speaks a bit of Hindi, as if that was not interesting enough – let us weigh the poor guy! So some guy fetched a weighed and I was measured there and then on the street. 110kg. It did not make the locals any less curious about me. I met Lucy Jumper first time in my life, way back in 2011 when I was visiting Istanbul. I met her through couch surfing, and we hit it off pretty well. Lucy is one of those people that is very easy to be around. We definitely had a fun time in Istanbul – lots of good memories! So somehow we managed to stay in touch even though she lives far away on the other site of the Atlantic ocean in the big apple, also known as New York city. Now this year, I was going to Paris to visit some libraries, and the Magnum photo office. Again Lucy surprises me by telling me that she was going to pop by Paris for the weekend – on her way to Chile!! Paris is definitely a slight detour to say the least, on the way to Chile, when your starting destination is New York city. Somehow most Americans I have met on my travels have either been recently graduated students on a gap year, or working professionals between jobs. My impression is that its quite a work centered culture and taking time off for long periods is just not an option (if you want to keep your job that is). Somehow Lucy manages to roam the world still! Also on a site node, this was one of the first outings of my brand new Fuji x100s. A lot of these photographs where shot indoors at iso 6400. I am amazed with the quality of this tiny camera. You practically do not need light any longer. Exciting times! Reunited with Lucy Jumper in Paris. Last time we met was in 2012 in Copenhagen. The kind french family hosting the first nights party. They made an excellent Margarita by the way! The funky bar hosting the first night out. Cool place! My first mango based cocktail. Have to say it did not disappoint! I can see me house from here!!! Juvaila enjoying the view! Very passionate French bartender cooking up some funky drinks! There is always time for some shopping when in Paris 🙂 Lucy shops for clothes (women!) and Bently has his priorities in order and shops for food. I have to say that I was quite pleased with the beers I ended up tasting. My criteria was to go for the darker beers – with funny names (such as Dark Arts, Negra Como Tu Corazon, Pleasant Nightmare, etc). Also I tried to go for something not too strong, and always half pints – a good strategy to maximise the amount of beers I was able to sample without passing out. To me there has always been something timeless about Cambridge – an interesting mix of contemporary with classic. It has always been something that attracted me to this city. It just has a certain kind of character that I haven’t managed to find anywhere else. Therefore I think black and white photographs is a nice fit for this event, to celebrate the timelessness of Cambridge. And just as black and white never goes out of fashion I don’t think beer ever will either. It was great catching up with friends again, it has been far too long since my last visit to Cambridge! As a side note – this was a great occasion to test my new Fuji x100s camera. Very pleased with this little gem! First things first – no British event without proper care for health and safety!! Warning – you must wear footwear, you must not smoke, you must provide proof of age, etc etc. God bless the health and safety – what would we do without it?? Cheers! First beer of the day – definitely not the last! Personally, I went for the “dark arts” as my first half pint. Good stuff! Smooth, and full of flavour. The beer hall. A mecca for beer lovers! This is what it is all about. Beer! (And cider/mead for some). At the Cambridge beer festival anyone is welcome – four legs, two legs, one legs – it makes no difference. A friendly athmosphere to enjoy beer, cider, mead, food, friendship and life. Why have one beer, when you can have two at the same time? Some call it greed… other call it dedication! Svend also goes for the two beers at the time approach. Nothing like a pipe shaped pork scratchings to bring out a smile! And of course there was plenty of food stands to serve the hungry masses! Fish and chips are still awesome btw – and a great nutritional complement to beer, I am sure! Usually when I come across something intriguing I do not hesitate to pick up my camera and shoot – as I know that whatever is causing this moment to be a potential interesting image may only last but a fraction of a second. However I have to admit, in this instance I was completely taken aback. I could not figure out what this pink slot machine was doing in an empty green room with a woman sitting enjoying her fruit in front of a TV. Having travelled a fair bit in Asia, I am no stranger to unusual settings on the streets, but I have to say this particular setup was a bit more random that what I am used to. Fortunately there was no risk of this scene disappearing anytime soon, and having caught my breath my instinct returned, and I raised the camera to my eye capturing this peculiar moment. This is what I love about places like Nepal. I don’t get to see places like this back home. This family had some spare space, and decided to turn it into a minute gambling place – I suppose. I don’t figure it is a particular successful business, but it is a business none the less. Actually in hindsight I regret not asking if I could play the slot machine – I would have loved to support her little business. I guess I was just too distracted by my roaring tummy. Gaoness and I enjoyed the scene for a moment – taking it all in. Then we carried on our search for a nice place to eat. Today I leave Nepal, after almost 40 wonderful days here. There are so many impressions from this trip to Nepal – I hope I will manage to materialize them soon, and share them here! All I can say for now is that this has been an amazing trip. I prepared for this adventure for a year. I managed to loose 15kgs of body weight finally getting under 100kg as part of the preparations. First time I visited Nepal in 2009 I was 128kg heavy, next time (in 2011) 115kg. Now I am slightly less than 100kg. I think it is safe to say that the quest for the mountains has been good for my health! Summiting Imjse Tse, 6189m was an amazing experience. Preparing for something for that long, and making the dream become a reality was nothing short of amazing. It is by far the hardest thing I have ever done in my life, and it motivates me and gives me the confidence to prepare for further adventures (next trip to Nepal is already in the making). When I left for this trip, some part of me was struggling coming to terms with my way of life – maybe it is time to settle down, maybe it is time to live a “normal” life? I think if it is one thing I have learned from this trip, it is you cannot hide from who you are. There is a reason that I keep coming back to this part of the world. There is a reason that I keep hitting the streets with my camera. There is a reason that I keep seeking out adventure. It is simply just who I am. I have realized that when I do what I love, I put out a lot of positive energy, and “good stuff” just happens in return. New opportunities arises. I meet new like-minded people. New projects appear. A fellow nomad and photographer friend Flemming Bo Jensen – who also is a great writer, wrote something on his blog a while back, that I can really relate to. As he said – “I am not running away from something – I am running towards to something”! The last few years has been filled with me running towards my dreams. I left England after living there for 4 amazing years – even though I was enjoying it immensely there. But I had dreamed for long to try to work for my dream company Miracle A/S in Denmark. After having fulfilled that dream – having a great time, learning a lot, working with some amazing people, I quit my job to pursue my dream of traveling the world, for an undefined period. It was an amazing journey! It ended up with me returning to Denmark to start my own company, which was a new adventure indeed. At the same time the preparation started for Imjse Tse. Now having fulfilled the dream of Imjse Tse, I realize that stopping with pursuing my dreams, and settling into a life that society calls “normal” would be silly. I don’t see the point of trying to be something that I am not, and trying to want something that most people want. I realize that living a different lifestyle, is not always a dance on roses – but life will always be a bumpy ride no matter how you live it. I think the best we can do is to go for what we want, and own up to the consequences. And I have never been more ready to do that, than I am right now. Of course I realize that doing crazy and sometimes dangerous things worries the people that I care about. And for that I am truly sorry – and I appreciate their effort to try and understand me. And thereby on a finishing note – thank you for all the support from my friends and family – it means the world to me! So long Nepal, and thank you for all the daal bhat. Hope to see you again come May! Clear skies, so we got to stare Mt. Everest into the eyes several times – she is still a beauty! Head feels good too – today was the day I was a bit worried about, due to the rapid accent (4 days ago I was at 0 meters, Denmark now at 3400+ meters). Last night I got to test my new awesome down sleeping bag I purchased – and yeah it rocks! I think the temperature was 5 degrees last night, and it felt waaayy to hot in the sleeping bag (its comfortable temperature is rated 3 to -25 degrees). So yeah.. – down rocks! As do marino wool too – thank you New Zealand for those awesome marino sheep! Greetings from Nepal where the daal bat is still tasting ever so great!